Blogger Blog Par Template: Hello Friends In today's article, we are going to tell you how to Upload / Install Template / Theme on your Blogger Blog. In addition, we will also learn about how to make that theme Mobile Friendly. You can use Blogger or WordPress to create your website on the Internet so that you can easily make your online earnings by creating a Blog / Website. In this way many people use Blogger and run their own blog but most people use the basic Template of Blogger, due to which the look of their blog is not very good and nor is it responsive. Because of this, most people do not like to visit again after visiting their blog. In such a situation, he can not even earn better earning from his blog. Therefore, you should install an Attractive and Responsive Template on your Blogger Blog which will be well open on Mobile / Desktop and also make it easier for people to read your articles. To install Template on Blogger Blog, you must have a Responsive Template, if you search on the Internet, then you can find many Responsive Template for Blogger, which can be downloaded in Free and Paid Version. Now if you are a beginner then you can start with Free Template and later when you start earning from your blog then you can do a Template Purchase by $ 40 - $ 80 so that you can work well on that template . First of all, you have to login to your blog's Dashboard for which you will first visit Blogger's Official Website www.blogger.com and open your Dashboard by entering your Login Id. Let us first tell you that whenever you have to make any changes in the design of your website, then you have to go to Themes Options and when you have to add a widget to your website, then you can click on the Layout section Have to go. Now because we have to change the theme, we will visit the Option of Themes. This option is available on the left sidebar on your Dashboard as you can see in the image shown above. 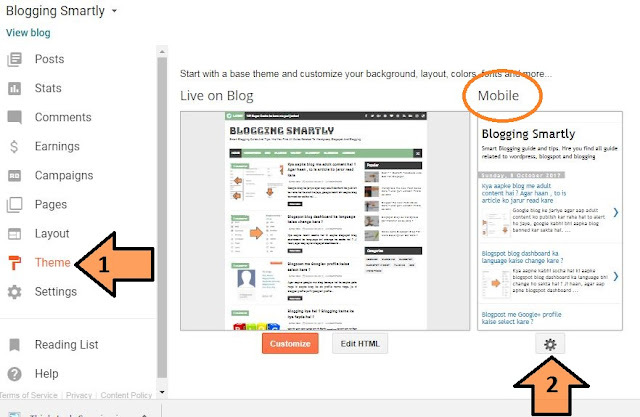 After visiting the Themes section, you have the Preview Show on your Blog in the Preview Show, which shows you Desktop / Mobile's Preview Show and you can understand how your website shows on two platforms. 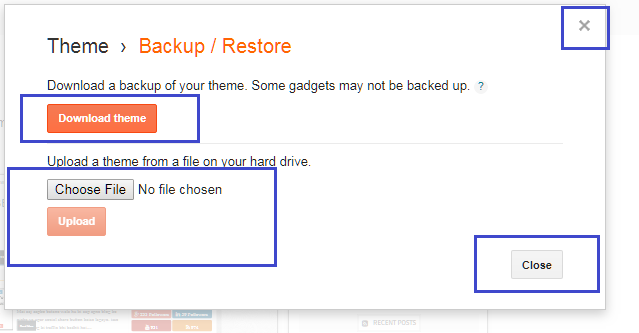 Now because we have to install a new theme, you will go to the option of Backup / Restore and click on the above. After clicking, a popup box resembling the image above will open on your screen and in this box you get some options. Now let's talk about installing New Theme, on this Popup Box, you get an option of Choose File which you can click on to install Save Theme on your computer. After clicking on Choose File, a lot of files will come in front of you in which you have to select the XML file and click on the button on the Open, so that the theme is selected on your Blogger Blog and you are right on the given Upload Click on the button to get the theme uploaded to your Blogger Blog. Note: When you Purchase / Download a Theme from Internet, it is in a Zip File, then first you extract that Zip File. 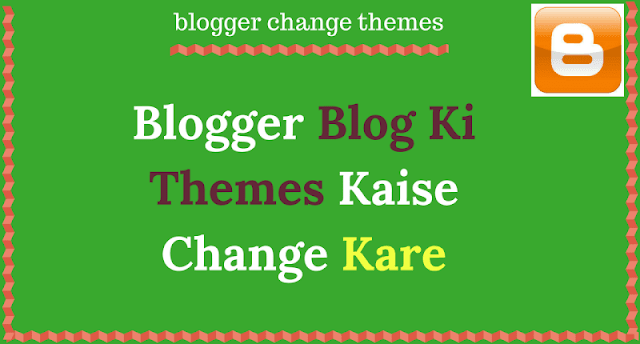 Now a new theme has been uploaded to your Blogger Blog and you can see the preview of that theme, as well as you open your blog in the New Tab, you will see that the look of your blog has changed completely. The Preview section is available on the Themes option, and you see the preview as the above image, in which you get two Boxes First- (Live on Blog) which shows Desktop / Laptop Preview Version and Second- (Mobile) That's Mobile Preview Shows. Now that you have to set your theme for Mobile, you have to click on the icon of the settings given below of Mobile Preview. This creates a new Popup Window on your screen and this Popup Window lets you create your Theme Mobile Friendly. You have to click on the option of No Show Desktop Theme on Mobile option, so that your Theme Mobile is displayed according to Design as you have seen before downloading the theme. Note: When you install a theme, on Mobile, it also shows the same as the Desktop Theme, so you have to manually set the No Show Desktop Theme on Mobile Option and your Theme becomes Mobile Friendly. In this way you can install any Blogger Theme on your blog and give your blog look like a website so that your viewers can easily navigate your blog, as well as Impress from the look of your blog. And always visit your blog. We hope that according to the above information you will be able to easily install your Blogger Blog Par Template / Theme and give your blog a better look. Now if you have any questions related to this topic then you can ask us in the Comment Box Thank you.